In our collection of green designer fabrics you will find every shade from pale sage to bright citrus to deep forest. 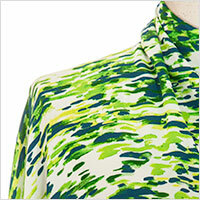 Mother Nature's favorite color has a shade that will work for lots of occasions from casual to dressy to business. Green coordinates quietly and beautifully with many other colors and we have all fiber types: wools, silks, cottons and blends. There's never been a better time to go green.